Digging ourselves out of the box. Above is a series of photographs of "Frames" an art installation by Andrew Kim - who also happens to be the man behind minimally minimal, a fantastically on-point blog and concept portfolio I would highly recommend checking out if you are looking for a bit of insight and inspiration. Kim's "frames" reveal to us the power the frame can have by contextualizing and organizing content. Frames isolate and deliver at the same time. ...it seems only right that cars should begin driving themselves and we can go back to watching the television of coastlines and highways that exist between our homes and our workplaces. "You see things vacationing on a motorcycle in a way that is completely different from any other. In a car you're always in a compartment, and because you're used to it, you don't realize that through that car window everything you see is just more TV. You're a passive observer and it is all moving by you boringly in a frame." What a brilliant observation - the act of driving truly is so close to a passive activity...it seems only right that cars should begin driving themselves and we can go back to watching the television of coastlines and highways that exist between our homes and our workplaces. Whether we are gazing through windows, walking through rectangular doorways, watching our televisions or recognizing our reflections in framed mirrors - it seems that life begins and ends at the end of a tunnel but repeatedly until death we pass from one frame into the next. It isn't architecture or automobiles I wanted to talk about today, though. It is technology and the content of our digital lives. It is unfortunate that "checking in" to your facebook requires a certain degree of "checking out"
Above is a series from the Microsoft Windows Phone ad campaign "Be Here Now." It aptly refers the way digital devices pull us away from "real world' experiences and deeper into the tiny rectangular universe of Facebook, Twitter and YouTube. I love the truth in the campaign, but I think it is a bit inauthentic of Microsoft to make the claim that somehow a windows phone will free you from the frame-centric, somnambulant, zombie-state which comes along with the territory of channeling all of that digital goodness through a 4 inch display. They have made some improvements to how quickly you can get in and out of certain features like photo-taking, status checking and internet searching, but in the end these tiny rectangular objects are still standing between us and the full attention those around us (who aren't checking their own smartphones) deserve. I think this is an increasingly sore spot for a society deep in the process of the digital revolution...the idea that technology is somehow forcing us to "tune in and check out." It is hard to feel a sore spot without dreaming of relief. It is unfortunate that "checking in" to your facebook requires a certain degree of "checking out" - or at the very least, holding a screen between you and the faces of those around you...touching a screen and not a fork, or a hand, or the steering wheel of your car. I believe that technology and design will soon relieve us of this problem, and it is one prediction one cannot help but expect to come true because it stems from a need so deep and so essential in all of us: the need to connect. While our digital interactions do offer a means of connection, it is an imperfect and deeply flawed way to interact with the world. There are already many signs that the separation between digital experiences and "real" ones will eventually disappear. The first, most essential step in this process will be the dissolution of the screen. The dissolution of the Screen: Transparency. I have been interested in transparent display technology for a while now. Nearly every time I bring it up, I get asked the question: "yeah, but what is it good for?" I get asked this question by everyone, especially those who are currently manufacturing transparent display technology (LG, Samsung, AUO to name a few). They are right to ask this, especially because right now there are very few usage models which are at all developed enough to take advantage of a transparent screen (augmented reality is a common answer). My answer is simply this: Connection. The ability to connect with something or someone on the other side of a display could be exceptionally powerful. Let's start with this most basic application. Above is the Loewe "Invisio" transparent TV concept by designer Michael Friebe. There is nothing more disruptive in my home than the somber presence of my 42" flatscreen TV. When I am not using it (most of the time), it just sits there, absorbing light, sucking the air out of the room. All of the furniture faces it, nothing surrounds it - the room feels unused when the TV is off - and in this way, it is as if the TV is insisting to be used, to be turned on and no longer be the inactive center of attention. Invisio is an obvious improvement to that problem. The TV retreats from focus when it is turned off, and becomes a window into the environment of the home, not a monolith to the act of watching television. Another interesting area I think about from time to time is the concept of two-way computing. This is a bit of a challenging concept, but it is built on the idea that we could benefit from broadcasting digital information into our environment in a way that this information can be interacted with and delivered back to us. Above is a clip from "The Future of Screen Technology" - a video created by The Astonishing Tribe, a group of UI engineers and designers recently acquired by RIM/Blackberry. It's interesting to see transparent technology facilitate a new interaction in this way. 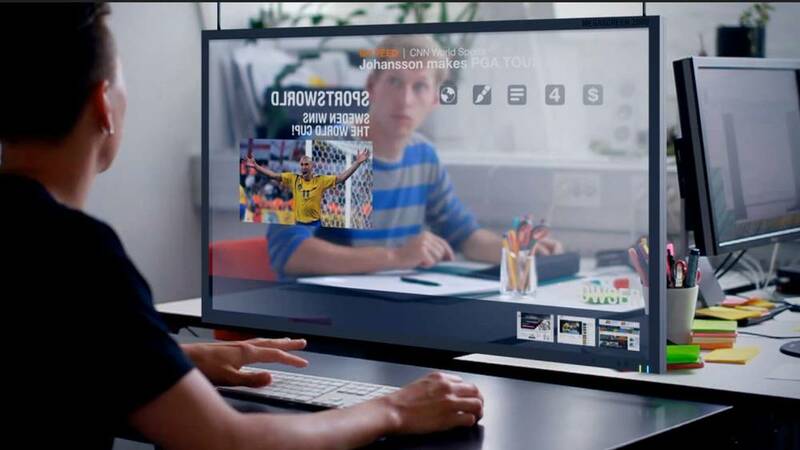 The next application is a bit more complex, but relates to the uses that most often come to mind when thinking about transparent display technology: the ability to overlay digital information over our environment by using the display as a sort of digital lens. Shown above is a Microsoft 2019 vision concept which shows a person using a tablet along with an augmented reality program to identify and call up information about the Blue Sage plant. Check out the opaque hand-grip on the side - not much more footprint than a smartphone, don't you think? I could see a whole PC architecture going in there 7 years from now, no prob. Google's "Project Glass" is another example of the "digital lens" which eliminates the need for touch controls and instead strives to integrate computing very deeply into our personas and daily interactions. The topic of wearable computing tends to spark deep conversations between my colleagues with words like "cyborg" and "cybergeek" popping up here and there. It isn't surprising, because a product like this starts to come very close to digital augmentation - to the grafting of our digital life onto our real-world lives and identities. Going transparent turns our displays into a two-way street, rather than the attention sucking "black holes" they are today...and this is a strong step toward pulling us back out of the swamp of digital life and back into the world we actually live in. It is a strong step toward relieving the strain digital devices currently place on our relationships. It's not the only way to do it, though. The dissolution of the Screen: Projection and Overlay. Above is a still from Frog Design's "Future 2020" concept video. 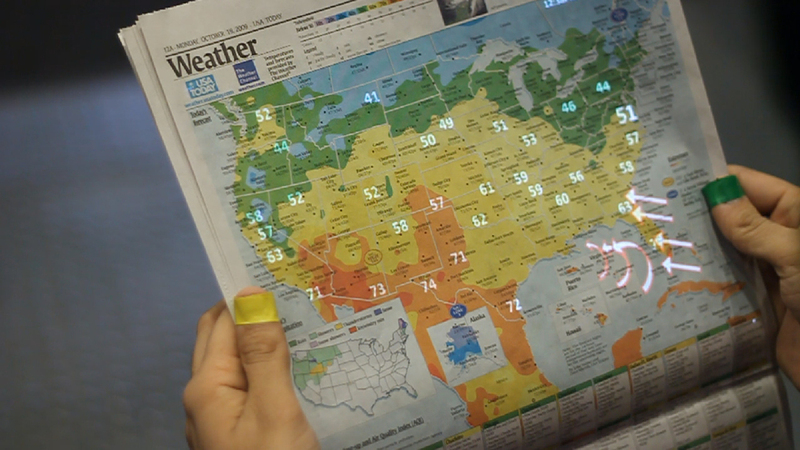 It is filled with examples of how digital information can overlay and inform our environment. The key here is that the role of "devices" is greatly diminished, and it is the information itself which takes center stage in the interactions. Here is another clip from Pranav Mistry's "Sixth Sense" device which overlays digital interactions over analog objects and landmarks...essentially linking them to the digital world through the application of both projection (output) and gesture sensing (input). Below is an example of how a device like this can turn any object into...any other object...simply by overlaying a new digital function. All of this is interesting when it comes to taking digital information and applying it to the world we live in....a sort of insertion or overlay of the digital world. But a third, most interesting possibility is the act of integration of the digital world into the physical one. I'm talking about digital objects, not devices. Dissolution of the screen: Object love. Zero N is a computer controlled environment in which objects sense and interact with whatever exists inside of it - digitally operated or not. It is a digitally aware world, with certain laws (in this case a magnetic field which creates the levitation and locomotion of this metal ball), and certain conditions (such as lighting, temperature, etc). Imagine a world where physical objects responded by gesture, by command or even by thought. In this case, the digital realm is a way of communicating intent to the physical one, and the act of interacting with it feels more like living in a world without boundaries than it feels like sitting in front of a TV screen. Above is the "Radio Ball" a digital object created by a friend of mine, Benoit Collette. It takes the fairly complex interaction of programming and selecting a radio station and turns it into a simple and delightful physical interaction through the combination of a radio tuner and an accelerometer sensor. Each facet or "cell" contains the coordinates for a radio channel. Explore the available channels by twisting and turning the ball, once you find one you like (the top cell is the selector) simply write the station on the cell facing up and set the ball down for some easy listening. Sometimes I look around me and I am struck with a sense of...I don't know...a sense of living in the past. When I look at an old photograph and see horses and carriages in the streets, or pocketwatches in pockets, or really any other sort of obsolete technology, I am struck by the contrast between that era and mine. Sometimes, though, I feel like I am struck by the contrast between my era and one that has yet to exist. I often feel this way when I look at a skyline bisected by powerlines, or when I see miles of backed up traffic...I often feel this way when I see people absorbed in their smartphone and tablet screens at restaurants and bus stations. We ARE living in the past, but so has everyone who has ever existed. We are lucky to observe progress in our lifetimes, and with the aid of technology, we are set to observe the greatest leaps of progress we have ever experienced. So far we have spent the last 60 or 70 years climbing deeper and deeper into our TV sets and computer screens, I believe the coming decade will watch us as we climb out of these boxes and look around for the first time in a very long time. I am extremely enthusiastic of what the contrast between those two eras will look like.